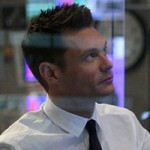 » Ryan Seacrest Productions Archive | Ryan Seacrest - The official entertainment news site of American Idol host and American Top 40 on air radio personality! The leading ladies of Hollywood are back to take the Big Apple by storm! We have the full promo here for Season 2 of ‘Kourtney & Kim Take New York’! We’ve got all the best moments from night 2 of Kim’s wedding for you! See what happened during Part 1 of Kim’s Fairytale Wedding! At your request, we’re airing the finale of “Keeping Up” season six in two parts with a full one-hour episode airing this Sunday! Just hours after Kim Kardashian and Kris Humphries tied in the knot in Montecito, California, we have the first video from the lavish ceremony. Kourtney Kardashian may be the eldest of the socialite siblings, but by the end of the year, she’ll be the last to be married and that doesn’t fare well with her mother. Check out the exclusive sneak peek of tonight’s new episode below of Brad getting playfully hit in the chest and head by a football launched by a shy grade-schooler named Josiah. Emmy winner Brad Garrett takes a hilarious and insightful look into the minds of kids in Ryan Seacrest Productions latest venture.